Help Mia Handwrite to collect all of the Golden Book Pages and rescue her little brother from the evil Wizard of Books. Magical Gloves is a funny and innovative platform game where your ability with the mouse will be crucial to solve puzzles and face different dangers. 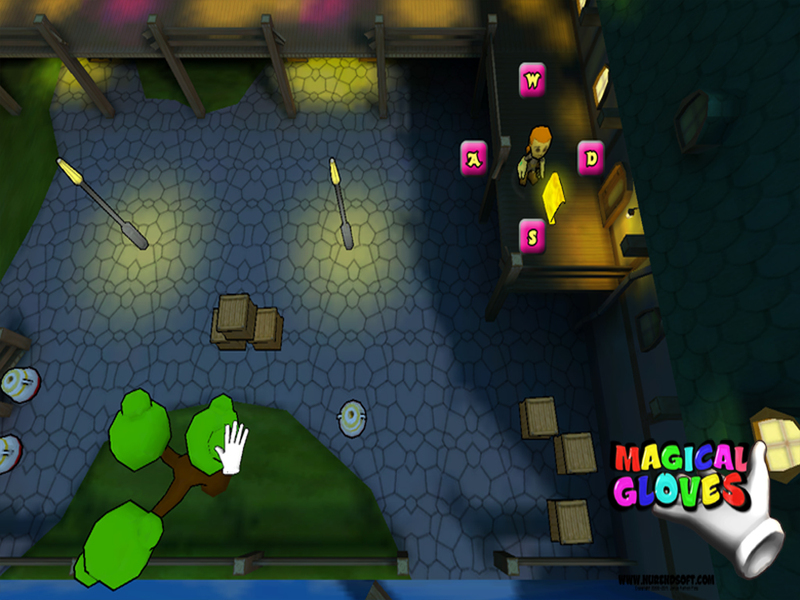 You can catch and throw any object or enemy, clean pictures, find buried objects and even use crank powered vehicles . You will explore a world of fantasy where you will meet a lot of different characters, from coward soldiers to gluttonous whales, while corssing frozen lands inhabited by amazing people. A fun new way to play with your computer that you could never have imagined before. Hours of entertainment spread over 3 different worlds, 16 missions and more than 30 hidden objects. - 4 theme worlds, full of challenges and different enemies. - 16 missions and over 30 hidden objects. - Play like never before using your keyboard and mouse. - Interact with everything you see on stage: boxes, barrels, trees, canyons, cranks, etc. - Grab and throw away your enemies to defeat them. - A wide variety of mini-games: memory games, fishing, creating a snowman, etc. - Winner of the first Independent Games Festival in 2010.